Trouble viewing the charts and tables? I’m classifying all the essays asked in last 19 years, into 8 broad topics. Since last 5 years continuously, no essay on technology or women empowerment. (see the continuity of those black dots in the table) As we saw in the mains analysis, the Women empowerment topic seems to be shifted from Essay papers to GS Paper 1. In the early 90s you were given 6-8 essays and you had to pickup one, they’ve gradually reduced the options to barely 4 essays! Economy is under dry spell after a long time (2011), otherwise since 2006, there has been 1-2 essays each year. ‘Education’ topic had atmost 2 continuous dry years during the entire 19 years period, otherwise they’ve been asking from it at a regular interval. Just like Education, culture too hasn’t seen lengthy dry years, same is true for Global/international issues. Philosophical essays were ‘hot’ in the initial years: 1993 to 1996, two essays per year and then abruptly stopped for four years. I guess the paper-setter retired or perhaps UPSC changed their ‘trend’ in those years for some reason. Polity /Administration has seen dry year only thrice. Seems UPSC has some personal grudge against science professors, when It comes to framing the essay paper, Only 6 essays so far from S&T in last 19 years! Or perhaps, to balance the advantage enjoyed by Science graduates in GS paper-II and to provide level playing field to non-science graduates, they’ve stopped asking S&T essays since last 5 years. 1993-2006, Women empowerment used to be a recurring essay topic, almost every year. Now what can be the speculations for 2012?? UPSC continues its love for culture, one essay will be asked (since Art n Culture as a topic is not given as much importance in GS paper1)? UPSC continues to ignore S&T and Women empowerment topic. (as they’re well covered in GS papers)? You can share your own speculations in the comments below! 2010 1. Geography may remain the same ; history need not. 2009 1. Are our traditional handicrafts doomed to a slow death? 2007 1. Independent thinking should be encouraged right form the childhood. 2006 1. Women’s Reservation Bill Would Usher in Empowerment for Women in India. 2004 1. India’s Role in Promoting ASEAN Co-operation. 2003 1. The Masks of New Imperialism. 2002 1. Modern technological education and human values. 2001 1. What have we gained from our democratic set-up? 2000 1. Why should we be proud of being Indians? 1999 1. Women empowerment: Challenges and prospects. 1998 1. The composite culture of India. 1997 1. What we have not learnt during fifty years of Independence. 1996 1. Literacy is growing very fast, but there is no corresponding growth in education. 1995 1. Politics without ethics is a disaster. 1993 1. My vision of India in 2001 A.D.
Sir plz upload some essays on last years topic written by toppers and civil service aspirants…….this will of very big use to us…….this kind of thing is not provided by any of the sites…………..this is not an individual request but from our group who is following u regularly……..this is not only individual requirement but of all those who are preparing for civil service…………..i hope u will take my request seriously………. 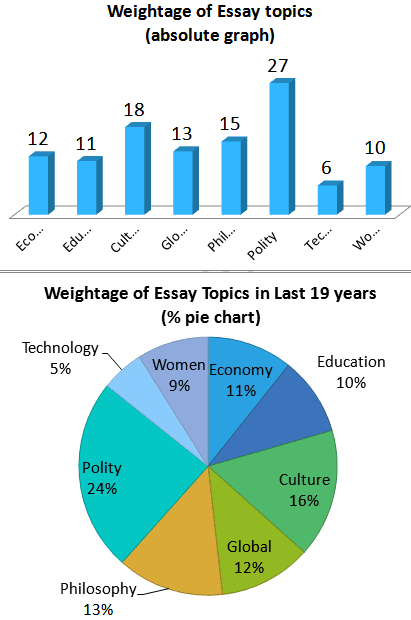 Please incorporate the 2012 mains essay topics in your analysis so that it gives a consolidated view. Carry on the good work. when opening in FOXIT the file asks for password. its working fine in adobe. plz check it out. Mrunal… this is the best site for UPSC preparation. Most of information is just a click away & I am so happy to have find this site :). Sir………. NO download option, can you post me the exact link, so that i can download 20 year essay paper. 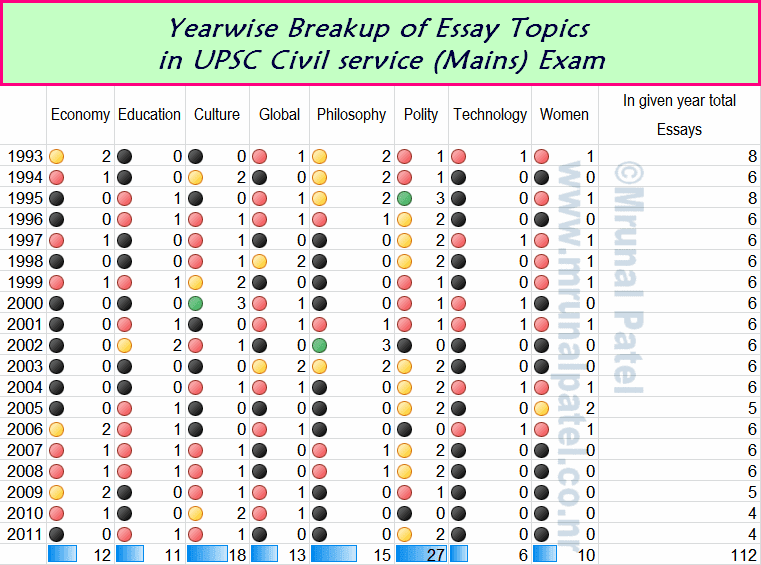 plz send me the link……..
Can you suggest some books for ESSAY WRITING for UPSC CIVIL SERVICES EXAM? Thanks…..this info realy impt for mi ..al data r best..
Mrunal bhai can you please update this article for cse 2014. Your prediction that sci tech and women empowerment would come came true. That is hell of a prediction considering how capricious upsc is. I want to appear UPSC in Gujarati.Because I think I am comfortable in that language and I can write 10 time better that any other languege in it. If I don’t write paper in English than those people will cut extra marks from my paper? Please! I am want help for essay&given good for writing & good advice. This is my hartelyrequest.please do u my help truly .